Ever use social media? Facebook, MySpace, or Twitter? Most likely, the answer is “yes”. Social media has become ingrained into our daily lives. And while these social sites provide many with a personal platform to connect with friends and provide personal details of our lives, what many do not realize is that this personal information may adversely affect your personal injury case. Just imagine the distress of being involved in an automobile or work accident that was not your fault, where you suffered pain and physical limitations, and loss of income, forcing you to file a lawsuit for compensation. After the lawsuit has been filed, the “discovery” period begins. This is the time when the parties are compelled to produce or turn over relevant documents for the other party to review. Now imagine, as part of the discovery process, having to provide the attorneys for the insurance company all of your social media login information and passwords. This allows them to meticulously go through all of your personal social media postings and pictures for information they deem to be “relevant” and to use against you at trial. This relevant evidence includes anything that will draw into question your personal injury claims. It may include postings and pictures highlighting the fact that you were “feeling good” and having a “great day” at any point after your accident. Pictures showing you and your family traveling on vacation, your participation in a sporting event, or even you holding your young niece or nephew at their birthday party may be highlighted. Then imagine the attorney for the insurance company showing a jury all of these personal postings and pictures and arguing that you clearly are not as hurt as you claim to be. Once a jury begins to doubt your injury claims, the value of your case may suffer. In light of this case law, it is important you protect yourself by not posting any information regarding an accident you were involved in. This includes information about the accident itself, your injuries, as well as pictures of you engaging in physical activities. All of that information could be used by the insurance company to distort the truth of the impact of the injuries on your life. 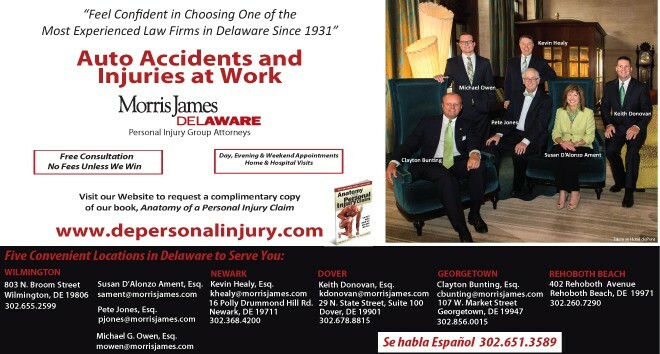 The Personal Injury Group Attorneys of Morris James LLP combined have over 150 years of experience in personal injury litigation and stay current on Delaware legislation affecting individuals involved in automobile accidents and injuries sustained on the job. If you or a loved one suffers the unfortunate event of an automobile accident or work accident, the Personal Injury Group Attorneys at Morris James LLP can guide you through a process that can be confusing and complicated. ← Previous Story Lawyer Bashing? Next Story → Are Uber drivers protected?